Mexico City or Distrito Federal (D.F.) is the capital of Mexico. We traveled there in May 2014 to visit a friend and collect sounds for our project The Touch of Sound, which features authentic sound recordings from around the world. We found the city to be rich in both history and culture, stimulating all of our senses in many ways. Please enjoy some of the sound highlights we were able to capture while exploring this dynamic location. On the afternoon we arrived at the historical center of Mexico City, the first thing we did was follow the crowds to a small taqueria where locals were lined up down the street. The sound of the tortilla press and the old rotisserie was just the first of the amazing soundscapes Mexico City has to offer. The delicious tacos also gave us a window into the many culinary delights that awaited us on our adventure (Taquería). After lunch, we wandered around the colonial area and through the Zocolo. At the time, the 2014 Cultural Fair was being held in the beautiful plaza and we were greeted by an orchestra (Street Orchestra). Our exploring eventually led us underground to the busy and crowded Metro in route to Coyoacán (Mexico City Metro). A thunderstorm (Thunderstorm) forced us inside a restaurant, where both the mezcal and mariachi music flowed (Mariachi Sing Along). On our second day we ventured back towards Coyoacán. Walking toward the plaza, we came across the gorgeous Viveros de Coyoacán Park. Its tree-lined avenues offer a nice contrast to the active city and provide a habitat for some of the city’s bird population (Viveros de Coyoacán Park). Upon our arrival to Coyoacán Plaza, we came upon an organ grinder entertaining visitors with playful melodies (Organ Grinder). After exploring the plaza, we headed back to Arena México to experience the spectacle that is Lucha Libre. The passionate crowd made the atmosphere electric as the wrestlers put on quite the show (Lucha Libre). On our way home, we passed an improvised Aztec drum circle at the Zocolo, which provided an excellent sonic nightcap (Aztec Drum Circle). The third day began with a trip to the Mirador atop the Torre Latinoameriacana building. The 44th floor provides a stunning view, a unique overhead soundscape of the city, and a glimpse into the true size of this expansive metropolis (Mirador). We followed our visit to the Mirador with a trip to Los Dinamos National Park. The park was a pleasant surprise, as we did not expect to take in much nature during our urban exploration. After an incredible lunch in the small village within the park (Los Dinamos Village), we hiked into the woods and found a secluded oasis in the mountains (Los Dinamos National Park). Our evening took us back towards Plaza Garibaldi, where we were serenaded by the abundance of mariachis (Plaza Garibaldi). Sunday morning took us to Mass in the San Jeronimo area, where we witnessed the First Communion of our friend’s cousin (Sunday Mass). The party following the ceremony was festive and went on well into the evening. During our last full day in the city, we explored many interesting sites. At the Mercado Merced, we were able to see the daily experience of both the vendors and citizens of the city. Outside, the vegetable vendors were preparing for the busy day ahead. Inside, the meat vendors were quite vocal in their attempts to draw attention to their products (La Merced Market). We followed the chaos of the market with the peaceful beauty of the Basilica of our Lady of Guadalupe and the Jardin del Tepeyac (Jardin del Tepeyac). The complex contains a number of chuches, and on that afternoon, visitors were attending a Mass at the modern Basilica (Basilica of Our Lady of Guadalupe Service). From there, we continued on to the spectacular pyramids of Teotihuacan. At the Pyramid of the Moon, you can hear the vendors trying to sell their whistles while visitors stroll around the gravel courtyard (Pyramid of the Moon). We ended the day climbing the Pyramid of the Sun. Sitting on top while looking out upon the ancient city and feeling its energy was an incredible experience (Pyramid of the Sun). Our last morning provided just enough time for a final stroll through the colonial center and the Zocolo. We were fortunate to catch the unique tonality of hand-rung bells of the Cathedral at noon for our final sound recording (Metropolitan Cathedral Bells). As we reflected on a truly amazing trip, our only regret is that we did not have more time to explore. We look forward to our next adventure in Mexico! 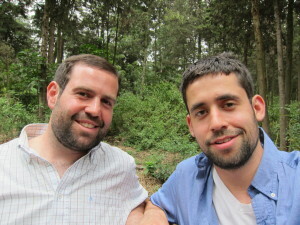 Marks Bros., Jonah and Jesse – Viveros de Coyoacán Park. May 2014.